taking office in December 2010. Feel free to browse the articles provided! Regional Councillor Joe Li presented the certificates of participation to the Seniors. The Non Profit Association was established on December 16, 2003 and supports cultural, social and recreational activities and the integration and adaption of its members into Canadian Society. Thank you to the organizers, volunteers, and supporters for their contributions and making this cultural Get-Together Event a great success. Markham Tamil Seniors Association Canada held its 14th Annual Cultural Get Together event at Wilclay Public School. Regional Councillor Joe Li presented congratulatory certificates to the association. The non profit association was established December 16, 2003 and supports cultural, social and recreational activities and the integration and adaption of its members into Canadian society. Thank you to the organizers, volunteers, and supporters for their contributions and making this Cultural Get Together event a great success. Joe Li welcomed special guest Honourable Peter Mackay, former Minister of National Defence, to his Re-Election Campaign Fundraiser. Many dignitaries, businesses, associations, constituents, family and friends attended this sold out event at Le Parc Banquet Hall on September 7th 2018. The evening was filled with delicious food and great singing and dancing entertainment. A reception was held for Honourable Peter Mackay to celebrate his visit and he later addressed the audience honouring Joe Li and his accomplishments. Joe Li was elected to Markham & York Region Council in October 2010 and 2014. The event was a celebration of Joe’s accomplishments for the past two terms as Regional Councillor, share his goals, and vision for the upcoming 2018-2022 term. Thank you to the volunteers, supporters, artists, and community members for their continued overwhelming support for Joe and for making the Joe Li Re-Election Campaign Fundraiser a resounding success! Regional Councillor Joe Li joined the Tsung Tsin Association of Ontario for its annual family Summerfest held at the Markham Museum. It was an exciting event for all ages featuring delicious food, games, live entertainment at the bandstand and many, more fun activities. The Vision Youth Fundraising Soccer Tournament 2018 was held at Berczy Park. Regional Councillor Joe Li attended in support of Vision Youth and the great sport of soccer with Eric Li and local families. It was a fun and enjoyable soccer tournament as in every year. Joe Li held his official Grand Opening for his Re-election Campaign Office. The event was held on Saturday August 18, 2018, located at 165 Gibson Drive, Markham, Ontario L3R 3K7. This great event was well attended by his family and friends. As Regional Councillor, Joe Li was elected to Markham and York Region Council both in 2010 and 2014. He has served the residents for almost 8 years and looks forward to everyone’s continued support in launching another successful campaign in the upcoming election on October 22, 2018. His fundraiser will be held on Friday, September 7, 2018. Congratulations and best wishes in his future endeavours! 31st World Hakka Conference will be held in Markham in October 2021. Thanks to Premier Doug Ford, York Region chair Wayne Emmerson is looking to keep his job, after all. A day after he said he was dropping out of the election race for the region’s top political job in this fall’s municipal election, Emmerson said July 27 he will seek another term through appointment. Emmerson’s about-face comes after Ford dropped a bombshell in municipal government circles July 27. Ford announced he is scrapping open general elections for regional chairs in York, Peel, Niagara and Muskoka. Instead, the chairs in the four regions will continue to be appointed by their councils, although chairs in other areas such as Waterloo, Halton and Durham region will continue to be directly elected. Emmerson said he’s pleased with Ford’s decision. “I think it’s a good move on the part of Premier Ford,” he said. Emmerson dismissed a suggestion he bowed out of the election race because he wouldn’t win. “Not so much that I didn’t have a chance but that’s an awful big election to run,” he said, although he acknowledged the scope of running a campaign for elected regional chair has been clear for some time. The Chinese Heart and Stroke Survivors and Caregivers Summit held at Courtyard by Marriott Toronto Northeast/Markham on Saturday June 16, 2018 was a great success! Summit examined the importance of rehabilitation, understanding the process of recovery, new skills and knowledge to cope with changes after heart disease or stroke, and the resources and services in our community. Thank you to Shan Qiao, Dr. Chi-Ming Chow, regional Coun. Joe Li, Natalie Gierman, Dr. Gordon Moe, Dr. Joseph Chu, Dr. Cindy Yip, Kenneth Lo, Joanna Wong, Dr. Raymond Chan, Suk-Han Lai, Clara Tse and the entire Heart and Stroke team for your contributions and inspiring participants with encouragement in one’s recovery journey and living a healthy active lifestyle. Chinese Heart and Stroke Survivors and Caregivers Summit held at Courtyard by Marriott Toronto Northeast/Markham on Saturday June 16, 2018 was a great success!! Thank you to Shan Qiao, Dr Chi-Ming Chow, Regional Councillor Joe Li, Natalie Gierman, Dr Gordon Moe, Dr Joseph Chu, Dr. Cindy Yip, Kenneth Lo, Joanna Wong, Dr Raymond Chan, Suk-Han Lai, Clara Tse and the entire Heart and Stroke Team for your contributions and inspiring participants with encouragement in ones recovery journey and living a healthy active lifestyle. Markham celebrated the completion of Stiver Mill Landscape Rehabilitation. Knabenpelle Norlingen, a 67 piece orchestra of young men ages 10-19 years old performed in traditional German attire. Germany is one of Markham's sister cities with a special connection to one of Markham's founders, William Berczy. A memorial ceremony observing the 10th Anniversary of Sichuan Earthquake & Photo Exhibit was held at the Markham Civic Centre. The Federation of Canadian Sichuanese Associates and the Sino-Can Sichuan Business Council jointly hosted this memorial ceremony to remember the many victims of the Sichuan earthquake in China, display the transformation of the disaster areas and show gratitude to the Canadian people and government for the humanitarian assistance provided a decade ago. South Asian Heritage Month was celebrated at Vedic Cultural Centre observing 180th anniversary of the Indian arrival in the West Indies May 5, 1838. Canada Diversity Celebration event was another grand success this year. Appreciation Dinner was held for the amazing team of artists who helped unite the Indian & Chinese communities together through music to celebrate diversity within our City of Markham, the most diverse city in Canada. The annual Indian-Chinese Hindi singing event was hosted by Chair Regional Councillor Joe Li, Co-Chair Amar Erry- President of ASM- Vedic Cultural Centre, Joe Samion, Hakka Canadian Association, and Neera Chakravorty Event Coordinator. Over 525 people attended this musical extravaganza at the Flato Markham Theatre. Thank you to the artists, volunteers, and supporters for their continued support and for the grand success of the show. Dignitaries, guests, ACCE Board of Directors and Advisors at the 2018 ACCE Chinese New Year Celebration held on February 21, 2018 at Markham Event Centre. (Front row from left): Joe Li, Regional Councillor of City of Markham; Alex Chiu, Councillor of City of Markham; Logan Kanapathi, Councillor of City of Markham; Nirmala Armstrong, Regional Councillor of City of Markham; MP Majid Jowhari; MP Mary Ng; Deputy Consul General Yaodong Zhuang, Consulate General of PRC in Toronto; Kevin Au-Yeung, President of ACCE; Senator Victor Oh; Florence Tsang, Deputy Director of Hong Kong Economic and Trade Office; Sandra Racco, Councillor of City of Vaughan; Godwin Chan, Councillor of Town of Richmond Hill; Alan Ho, Councillor of City of Markham and Castro Liu, Councillor of Town of Richmond Hill. (2nd row right 1): Stephen Bald, Vice President of BDC. 2017 ACCE annual Christmas Celebration was held on December 6, 2017 at the Casa Deluz Banquet Hall. (Front row from left): Alex Chiu, Councillor of City of Markham; Logan Kanapathi, Councillor of City of Markham; Amanda Collucci, Councillor of City of Markham; Consul General He Wei, Consulate General of the PRC in Toronto; Kevin Au-Yeung, President of ACCE; Kathy Chan, Director of Hong Kong Economic and Trade Office (Toronto); Joe Li, Regional Councillor of City of Markham; Nirmala Armstrong, Regional Councillor of City of Markham; Florence Tsang, Deputy Director of Hong Kong Economic and Trade Office (Toronto). (Middle row from left) Consul (Commercial) E Defeng, Consulate General of PRC in Toronto; Minister David Zimmer, Minister of Indigenous Relations and Reconciliation; Tom Vegh, Councillor of Town of Newmarket; Peter Lawler, Executive Vice President of BDC. ONTARIO CONSTRUCTION REPORT - "Strong development applications expected in York Region"
Development remains strong in York Region, however the types of proposals submitted over the past five years has changed, according to York Region’s 2017 Development Activity Summary. Today, 60 percent of the region’s housing mix consists of semi-detached, townhouse and apartment units. This trend continues to increase year-over-year, according to the Regional Municipality of York. A total of 283 applications were reviewed and responded to by regional staff in 2017 including: 40 official plan amendment (OPA) applications; 67 subdivision or condominium applications conditionally approved; an additional 60 subdivision or condominium applications cleared for construction; 70 site plan application approvals; and 46 engineering approvals. The City of Markham lowered their flags at half-staff since April 9th in honour of the fifteen lives tragically lost in the Humboldt Broncos crash last week. A public vigil was also held April 11th for the victims, their families and the community of Humboldt. Mourners were able to sign a book of condolences located at the Civic Centre and seven community centres around the city. Mayor Frank Scarpitti, Regional Councillors Nirmala Armstrong and Joe Li, were joined by national journalist Lloyd Robertson and other members of council at the vigil. Members of Markham’s hockey community, including the Markham Royals, Markham Thunder and minor hockey groups also attended. Everyone was invited to wear their jerseys and bring sports equipment such as hockey sticks to leave at the Peace Flame in the courtyard of the Civic Centre. Canada’s Diversity Celebration Team held its 7th annual Indian-Chinese Bollywood singing event at the Flato Markham Theatre. Chair, Regional Councillor Joe Li, hosted the event with Co-Chair Amar Erry- President, Arya Samaj Markham- Vedic Cultural Centre, Joe Samion, Hakka Canadian Association and Event Coordinator Neera Chakravorty. This Indo-Chinese Bollywood concert provided a unique platform to many local artists and brought the two communities together to celebrate unity and diversity in Markham.The program featured 20 talented amateur vocalists who sang a variety of popular and classic hits in Hindi, Chinese, and English. Dignitaries in attendance included MP Mary Ng, Mayor Frank Scarpitti, Deputy Mayor Jack Heath and Councillors Alan Ho and Logan Kanapathi. Congratulations Regional Councillor Joe Li and team for another successful year! Yvonne Li, wife of Regional Councillor Joe Li, hosted the grand opening of her new restaurant called Li Dynasty Indian Hakka Chinese Cuisine located at 9750 Markham Road, Units 1&2. The special occasion was celebrated with a ribbon cutting ceremony followed by two wonderful lion dances. Guests included Mayor Frank Scarpitti, Regional Councillor Nirmala Armstrong, Councillors Alan Ho, Don Hamilton, Amanda Collucci, Alex Chiu, Andy Taylor, CAO City of Markham, MP Shaun Chen of Scarborough North, Sandra Tam, and Indian Community leader Amar Erry. Everyone enjoyed a delicious fusion of Indian Hakka and Chinese cuisine. There is one house on Markham's Williamson Road that smells so bad of skunk neighbours say they can't enjoy their yards in the summer. During other seasons, they say the smell actually seeps through their walls, smelling up their houses with the pungent odour. Problem is, it's a not pest issue — it's a marijuana one. “I want to sell my house, but with this smell, it's not worth anything,” said one neighbour who did not want his name published. In the past three months, Markham Coun. Joe Li has received 10 calls about marijuana grow-ops in Markham. Although unsure exactly which operations are legal, with licences from Health Canada, Li's unsure that really matters. What is important from his perspective is that residents are struggling to deal with often odious scents coming from these homes, with little or no recourse. “I don't think this policy has been thought out carefully,” Li told yorkregion.com. In the Williamson Road situation, the owner is breaking no rules, considering he has a medical marijuana licence to grow plants at his residence. Page One News added 4 new photos. MARKHAM- Yvonne Li, wife of Regional Councillor Joe Li, launched her Li Dynasty Indian Hakka Chinese Cuisine restaurant at 9750 Markham Road, Markham. This special occasion was celebrated with a ribbon cutting ceremony followed by two wonderful lion dances. Among the guests were MP Shaun Chen of Scarborough North, Mayor Frank Scarpitti, Regional Councillor Nirmala Armstrong, Councillors Alan Ho, Don Hamilton, Amanda Collucci, and Alex Chiu along with City of Markham’s CAO Andy Taylor, Sandra Tam, and Indian Community leader Amar Erry. Family and friends enjoyed a delicious fusion of Indian Hakka and Chinese cuisine. The dawning of a new dynasty arrived recently in Markham as Regional Councillor Joe Li, along with wife Yvonne and other family members formally opened the doors of their latest venture, a Hakka, Indian, Chinese fusion cuisine. While a fairly unique concept in Markham, the newly designed Li Dynasty restaurant takes its culinary cues from a similar taste platform pioneered in Toronto by Joe Li’s brother. The new restaurant on Markham Rd. north of 16th Ave by the Home Depot managed to draw local politicos including most of Markham town council, community leaders and even a Liberal MP, Li’s cousin. While Li, being the politician of the family as a councillor and nomination candidate for the Ontario PC party in the next provincial election, he was clear that the real work behind the Li Dynasty is being done by his wife Yvonne. With kids, parents, siblings and friends all present, the Li Dynasty is a true family effort that promises to be more than a centre for the over 10,000 Markhamites of Hakka Indian Chinese ancestry. Yvonne Li, wife of Regional Councillor Joe Li, launched her Li Dynasty Indian Hakka Chinese Cuisine restaurant at 9750 Markham Road, Markham. There were 1,000 people in attendance at Mayor Frank Scarpitti’s eighth, annual Chinese New Year Dinner held at Le Parc Dining & Banquet Hall. “Eight is a significant number in Chinese culture,” said Mayor Scarpitti. “I am proud to celebrate eight years as a community united by our shared respect for tradition and our hope for a bright and prosperous future." Mayor Frank Scarpitti, Co-Chairs Regional Councillor Joe Li, Councillor Alan Ho, Councillor Amanda Collucci and Councillor Alex Chiu welcomed everyone to the celebration and fundraising occasion. The event opened with a procession led City of Markham Honour Guard Firefighters, York Regional Police Ceremonial Unit, Southern Lions, Northern Lions and the God of Fortune. The festivities began with an eye-dotting ceremony and Lion Dance followed by a delicious dinner including a spectacular Year of the Dog cake. Chinese artists and performers entertained as well as a special performance given by singing impressionist André-Philippe Gagnon. Funds raised were donated to the following recipients: Hakka Helping Hands, $10,000, Sanatan Mandir Cultural Centre, $10,000, Federation of Chinese Canadians in Markham,$35,000;Eabametoong First Nation, $25,000. "What really makes this evening special is the money raised for various worthy causes in our community, a big thank you to all who make Markham a giving, caring city," said Mayor Scarpitti. We are so happy to share this GOOD NEWS with our community that SMCC was presented a cheque of $10,000.00 at the MAYOR FRANK SCARPITTI'S CHINESE NEW YEAR DINNER as Councillor Alan Ho's beneficiary for 2018 on February 22, 2018 at Le Parc Dinning & Banquet Hall. Councillor Alan Ho’s New Year's Levee was a great success. Over 300 residents attended the reception on a warm Saturday afternoon, conversing over food and enjoying entertainment. In addition, they were updated by Councillor Ho on Markham news and events including recent local break-ins and how residents can be proactive in preventing this type of criminal activity. There were also some lucky residents who took home wonderful, lucky draw prizes to family and friends. Markham regional Coun. Joe Li will seek the Markham-Unionville nomination. Li made the announcement on Sept. 12 in a press release, but will make his official announcement on Sept. 13 at a lunch reception. After seven years as Markham regional councillor with the Regional Municipality of York, Li is now seeking to grab the nomination for the Markham-Unionville riding for the Ontario Progressive Conservative Party. According to his press release, Li has much experience having saved taxpayers’ dollars, introducing transparency policies, introducing sustainable waste management technologies in Markham, bringing together community groups and forging international partnerships between Markham and municipalities in Sweden, India and China. Li will make his official announcement at a lunch reception on Sept. 13 at Golden Palace Banquet Hall at 11 a.m. The hall is on First Markham Place, 3225 Hwy. 7 East in Markham. DESI News Special Edition of Canada 150. Regional Councillor Joe Li, "Indian by Birth, Chinese by descent, Canadian by choice". A Senior's Luncheon at Le Parc Dining & Banquet hall was one of the activities held as The City of Markham celebrated Canada’s 150th birthday. Councillor Don Hamilton and Regional Councillor Joe Li with the Markham Sunglow Senior and Family Association as they celebrated Canada's 150th birthday at Ray Street Park with a variety of beautiful performances. Snap Markham- "Canada’s Diversity Celebration Team held its 6th annual Indian-Chinese Bollywood singing event at Flato Markham Theatre. Chair Regional Councillor Joe Li hosted this cultural event in collaboration with Co-Chair Amar Erry- President of ASM- Vedic Cultural Centre, and Joe Samion- President of Yin Hua Association of Ontario. This Indo-Chinese Bollywood singing event provided a platform to unite many local artists, bring the Indian and Chinese communities together and celebrate unity and diversity. The program featured a mix of 18 talented Indian and Chinese amateur singers who sang a variety of popular and classic hits in Hindi, Chinese, and English. Over 527 people attended including representatives from both Chinese and Indian Consulate Generals' Offices." RC Joe Li represents Markham at 2017 Bengal Global Business Summit. Regional Councillor Joe Li, a native of India, was on hand at the inauguration of the 2017 Bengal Global Business Summit, India, meeting with India's Chief Minister of West Bengal, Mamata Banerjee, as well as Canadian Trade Commissioner Arjun Kumar Dutta. Through a 2016 Markham trade mission to India, West Bengal's RAD 365, an IT service provider that delivers software solutions, teleradiology, knowledge processing and data analytics solutions to the health care industry, established an office in Markham. RAD 365 is located in Bidhannagar's high-tech district outside Kolkata, West Bengal, India. Regional Councillor Joe Li said he didn't want to deal with a problem that reflected just 5 per cent of the market, citing statistics reflected in a recent Toronto Real Estate Board report that said just 4.9 per cent of GTA homes are purchased by foreign buyers. More importantly Li said, he didn't want to fingerpoint at one community. "In general, people know who you're talking about. It must be the Chinese. I don't want that kind of impression." Meanwhile, regional councillors have repeatedly said they have no appetite for making the regional chair an elected position. While most mayors and councillors have said the current system is working well, some councillors have complained about the method of selecting the chair. For example, Markham Councillor Joe Li has said the regional chair should be accountable to the region’s 1.1 million residents, not just 20 mayors and regional councillors. Under the current system, candidates for the job have to curry favour with mayors and councillors behind the scenes to get their votes, he said last November. “In order for the chairman to get his position, he has to make deals,” Li said, saying he was given a coveted position as vice-chair of the region’s planning and economic development committee, an important title on trade missions. Ballard praised regional and local councillors and residents who fought for an elected chair, which he said accomplished “something very special in our province”. Canada Diversity Celebration- March 26 2016-Canada’s Diversity Celebration Team held their 5th annual Indian-Chinese Bollywood singing event at Flato Markham Theatre. Regional Councillor Joe Li organized this cultural event in collaboration with Mr. Amar Erry- President of Vedic Cultural Centre, and Mr. Joe Samion- President of Yin Hua Association of Ontario. This Indo-Chinese Bollywood singing event provides a platform to unite many local artists, brings the two communities together, and celebrates unity and diversity in our City of Markham. The event featured a mix of 17 talented amateur singers who sang a variety of popular and classic hits in Hindi and Chinese. Markham Business Delegation Reception- ICBC invites members and guests to the joint business reception hosted by Deloitte, Indian Chambers of Commerce and Indo Canadian Business Chamber for the delegates from The City of Markham, Ontario, Canada on Monday, 8th February, 2016 at Bengal Club. Will the Dragon Dance Again? Kolkata's Chinatown, the oldest in India, has been in decline for decades. An ambitious revival project now aims to alter the community's future. "This Thursday, York Region Council will be voting on a motion tabled by Markham regional councillor Joe Li. Li is asking the council to endorse Newmarket-Aurora MP Chris Ballard’s private members bill calling for the chair of York Region Council to be elected by the public. Currently, only the mayors and regional councillors decide and vote on this appointment. "Markham votes yes to voting in York's regional chair"
A majority of Markham councillors have voted in favour of electing the York Region chairperson. A motion, put forward by ward councillor Karen Rea, puts the city’s support squarely behind Bill 42 and calls on the province to get the ball moving in time for the 2018 municipal election. The motion passed 9-4 in a recorded vote. Councillors Alan Ho, Don Hamilton, Karen Rea, Colin Campbell, Logan Kanapathi and Alex Chiu along with Regional Councillors Jim Jones, Joe Li and Nirmala Armstrong voted in favour. Mayor Frank Scarpitti, Regional Councillor Jack Heath and Thornhill Councillor Valerie Burke voted against the motion. Councillor Amanda Collucci abstained, which under the Municipal Act counts as a vote against. Rea’s motion goes hand-in-hand with Li’s motion at the regional level, to be debated Nov. 19. In order to change the makeup of regional council, a triple majority is required. That means, a majority of regional council, a majority of municipalities and of those municipalities, they must represent a majority of York Region residents. Markham as a whole represents about a third of York Region’s population. There is growing support in the region, with motions coming before Whitchurch-Stouffville, Aurora and Richmond Hill local councils, he added. During a debate on Rea’s motion, the current system of appointing the regional chairperson was referred to as a small circle of voters where back-door trading takes place. “We hear a lot of ‘You support me on this and I support you on that’ type of deals,” said Robert Mok, representing the Markham Citizens Coalition for Responsive Government. “More elections doesn’t improve democracy,” said resident León Brumer. It was suggested electing a chairperson opens up a Pandora’s box when it comes to campaign support, which could come from special interest groups and developers. Regional Councillor and deputy mayor Jack Heath agreed. Having a regional chairperson backed by heavy development could pose a problem since the region does not deal with issues such as parks or greenspace. But local mayors are also supported by development, argued Regional Councillor Nirmala Armstrong. There has been movement to eliminate local powers over items such as planning, waste management, fire services and water and wastewater, Heath argued. But other councillors argued power already sits in the hands of the chairperson, so the position should be made accountable. View from Queen's Park: Time to elect the Chair of York Region. Some York Region councillors pushing to have elected chair. "In a region of 1.1 million residents, it only takes 11 people to select York’s most powerful political leader. Markham Regional Councillor Joe Li and Whitchurch-Stouffville Mayor Justin Altmann want to change that.On Nov. 19, Li will bring in a motion, seconded by Altmann, asking councillors to make the regional chair an elected position." Motion for an elected Regional Chair by Regional Coucnillor Joe Li Whitchurch-Stouffville Mayor Justin Altmann. Regional Councillor Joe Li supporting Toronto Indian Cultural Association to present Bollywood Singer Sadhana Sargam in a spectacular community event for youths, local, and international artists. "Elected Regional Chair idea makes a comeback." In the fall of 2015, this Motion will be submitted to the Regional Municipality of York by Regional Councillor Joe Li. Frustrated with backroom wheeling and dealing in advance of the appointment of York Region’s chairperson, Markham Councillor Joe Li wants to make the job an elected position. He will bring in a motion this fall asking regional council to advise the province it wants the chairperson’s job to be elected in time for the next term of council following the 2018 municipal elections. “I’m working on that. When I was campaigning for re-election (last year), a lot of people asked me why the regional chair is not elected, so I made a pledge if re-elected, I will make sure it’s going to happen,” said Li, adding Whitchurch-Stouffville Mayor Justin Altmann has indicated he will second the motion. Regional Councillor Joe Li & inaugural Council Meeting of the 2014-2018 elected members of Council of the City of Markham The occasion also marked the 220th anniversary of the founding of Markham held at the Flato Markham Theatre and was followed by a reception in the Markham Civic Centre Great Hall. Joe Li relected Markham Regional Councillor for another 4 year term. Election night victory party celebration with volunteers and supporters. Regional Councillor Joe Li, a founding member, supports the Lions Walk/Run for Happiness. This event helps bring awareness for Mental Health and the proceeds go to the Canadian Mental Health Association, Markham Stouffville Hospital, and Ontario Shores Centre for Mental Health Sciences. All for a great cause. Office is located at 7750 Kennedy Road , Unit 6 in Markham. Markham Regional Councillor welcomed the Vice Mayor Huang Xueyuan and the business delegation from Zhangjiagang, China. Naming Ceremony of Lesley Price Woodlot At Milne Dam Conservation Park. Sudha Om Dhingra, Dhingra Family Foundation hosted their inaugural Hindi Chetna-Dhingra Family Foundation International Literacy Awards Ceremony. 25th Anniversary of Ecole Catholique Sainte-Marguerite Bourgeoys (Markham). A special milestone for this French community in Markham. Regional Councillor Recieved the Outstanding Achievement Award for his community service. Regional Councillor Joe Li thanking the many local Artists who participated in another successful Indian-Chinese Bollywood singing extravaganza. He provided a great platform to unite both the Indian & Chinese community and creating a stronger bond in the most diverse City in Canada. Congratulations to Regional Councillor Joe Li for another successful Indian-Chinese Bollywood singing extravaganza. He worked with 30 local artists and many volunteers over the past several months. He worked jointly with Mr. Amar Erry from Vedic Cultural Centre, and Johnny Chung from Yin Hua Association of Ontario to celebrate rich cultures of Indian & Chinese community and created a stronger bond between the two communities in most diverse City in Canada. ReelWorld Film Festival in Markham. Gala Reception Gala at the Cornll Community Centre. Markham Regional Councillor Joe Li was a Sponsor for the Lions Club International District A16 - 1st Annual Lions Walk/Run for Happiness. This event helped create awareness for Mental Health and funds raised went to three major beneficiaries Markham Stouffville Hospital, The Ontario Shores Foundation for Mental Health Sciences and the Canadian Mental Health Association- York Region. Joe hosted Canada’s Diversity Celebration: A Musical Evening Showcasing Our Rich Culture bringing communities together, celebrating Chinese-Indian cultural diversity, through singing and music. It is co-organized by Mr. Amar Erry of the Vedic Cultural Centre and Mr. Johnny Chung of the Yin Hua (Chinese from India) Association of Ontario. This year’s show featured a mix of over 20 talented amateur singers of Chinese and Indian backgrounds who sang a variety of popular and classic hits in Hindi and Chinese. Our Mayor Mr. Frank Scarpitti made a special guest appearance debuting his Cantonese and Mandarin singing accompanied by a violinist and an erhuist. The evening was a great success. It was very well-received and well-attended with a full house of over 500 guests, over 20 local singers, VIPS, and dignitaries. Click Here to view photos. 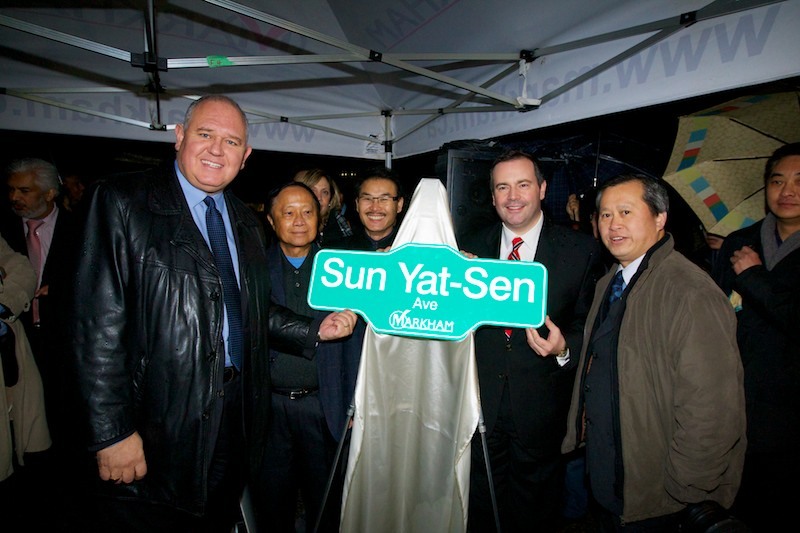 "Markham's NHL dream takes a hit, courtesy of deputy mayor"
" Markham's NHL-size arena project losing support"
An initiative spearheaded by Joe, Sun Yat-Sen Avenue was officially unveiled on December 4, 2011 by Mayor Scarpitti and other Members of Council with the Federal Minister of Citizenship, Immigration and Multiculturalism Jason Kenney as their honoured guest.